This detailed Palekh box has been drawn by Arapova Anastasiya.Anastasiya is a daughter of established Palekh Masters- Andrey Arapov and Natalie Arapova. Andrey till 2016 has been working as a teacher in Palekh Art school, Natalie has been painted icons. 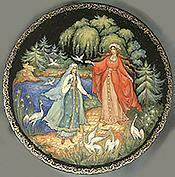 The box shows a scene from the popular fairy-tale "The Snowmaiden", or "Snegurochka". Here we can see the Snowmaiden saying "goodbye" to her mother Fairy Spring. The scene is painted in the icon painting style, which has been passed on from generation to the next and used in painting beautiful scenes like this. The detail is executed with precise brushwork, and with the aid of gold that also brings out the bold quality in the colors. The box is constructed out of paper-mache. Black lacquer covers the exterior and red lacquer covers the interior of the box. The exterior is decorated with intricate gold ornaments. The lid is not hinged, and the box rests on three round legs. The work is signed with the artist's name, Palekh and the year of 2016.